It wasn’t until the first century B.C. that the Romans invented swimming pools, originally used for bathing and seen as a sacred communal activity by Roman society. As time went on, swimming pools were developed for recreational purposes and little huts built from stone, tile and straw started popping up; serving as dressing rooms for people to change into swimsuits. The Latin word for hut was ‘capanna,’ from which the Spanish word, ‘cabaña,’ was derived and in English, we now call these huts —cabanas. Since their introduction years ago, the swimming pool has ascended to fame and luxury cabanas have become a hotel necessity for travelers everywhere; it’s even a must in residential communities. With designer touches and sophisticated new amenities like LCD screens, lounge seating, private kitchenettes and more, cabanas are once again redefining the traditional term and taking poolside leisure to the next level. Casa Marina, A Waldorf Astoria Resort: Overlooking the largest private beach in Key West,Casa Marina, A Waldorf Astoria Resort, boasts a Beach Concierge who pampers lounging guests every 90-minutes with surprise-and-delights like smoothies and chilled eucalyptus towels. The luxury poolside cabanas, complete with a TV and mini-fridge, come with a “push button” for when you want to contact a Concierge for a drink refill or food order. With a menu of special cabana packages, the Family Package comes with waterproof disposable cameras and pool toys and the Recovery Package comes with bloody mary’s or mimosas and Advil. Grand Hyatt Baha Mar: Situated along the sparkling white sand beaches of Cable Beach in Nassau, Bahamas, Grand Hyatt Baha Mar’s six elaborate pools feature luxurious in-pool cabanas surrounded by trickling rain screens, climate-controlled, pin-striped cabanas with TVs and private bathrooms, and secluded clamshell daybeds dramatically positioned in the center of a pool. Hilton Orlando: Just minutes from Orlando’s iconic amusement parks, the newly refreshed cabanas at the Hilton Orlando provide a much-needed respite for guests after a jam-packed day at the parks. Guests renting day-time cabanas can lounge on the lazy river and enjoy flat screen HD TVs, a fresh fruit basket and a choice of six beverages. Staff is available on-call to tend to all beverage and dining needs and can deliver poolside bites such as hamburgers and margaritas from the nearby Tropics Bar & Grill. Iberostar Grand Hotel Bavaro: Located in Punta Cana, the five-star, all-inclusive resort, Iberostar Grand Hotel Bavaro is reserved exclusively for adults. From personalized butler service and spacious, centrally located cabanas allow guests to be a stone’s throw away from the pool, ocean and the swim-up bar. Everything at Grand Bavaro is created to spoil and pamper like never before. Jewel Grande Montego Bay Resort & Spa: Whether looking to lounge poolside or beachside, guests staying at the brand-new Jewel Grande Montego Bay Resort & Spa are in for a treat. The all-suite butler-appointed resort boasts a mobile Dazzle Dry™ mani/pedi cart for those looking to be pampered poolside and a special Salted by the Sea couple’s poolside cabana reflexology treatment – complete with a chilled Himalayan rock salt shot glass of tequila. 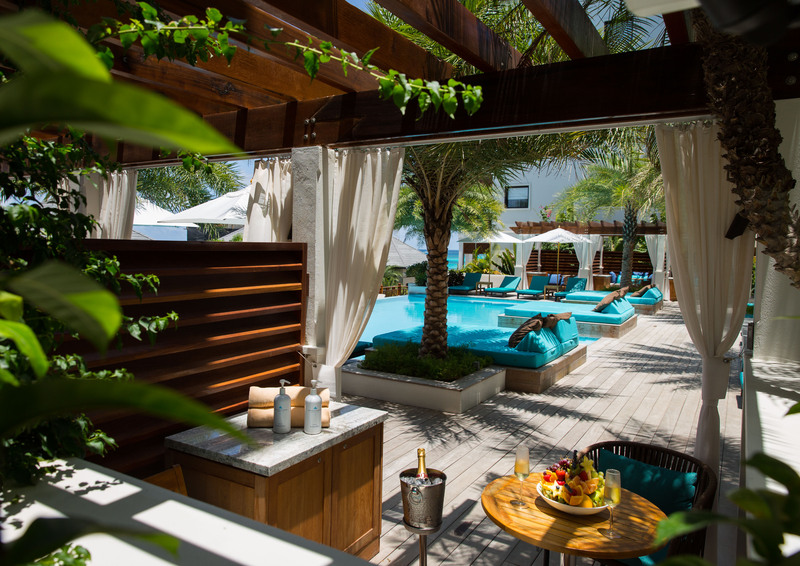 The St. Regis Bal Harbour Resort: World-renowned luxury furniture brand Roche Bobois, has redesigned the lavish 600-square-foot Oceanfront Day Villas at The St. Regis Bal Harbour Resort. Complete with marble floors and walls, the resort’s villas feature antiqued mirrors, plush daybeds, shower, flat screen TV, Bose iPod docking station, mini-fridge and St. Regis Butler Service. 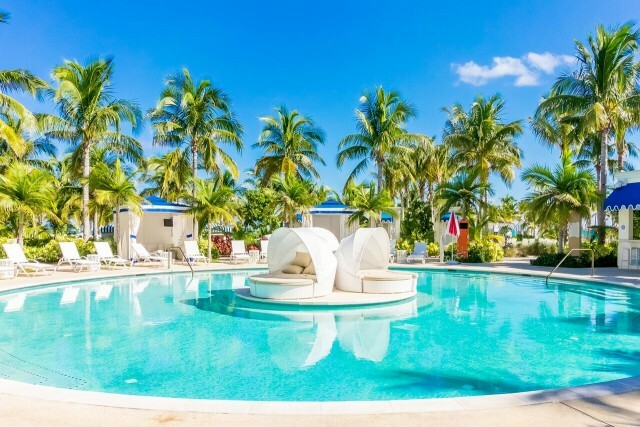 Sea View Hotel: Built in 1948, Sea View Hotel has served as a destination for generations of celebrities, dignitaries and families looking to wade in the hotel’s Olympic-sized pool and lounge in one of the 50 Key West-inspired cabanas. 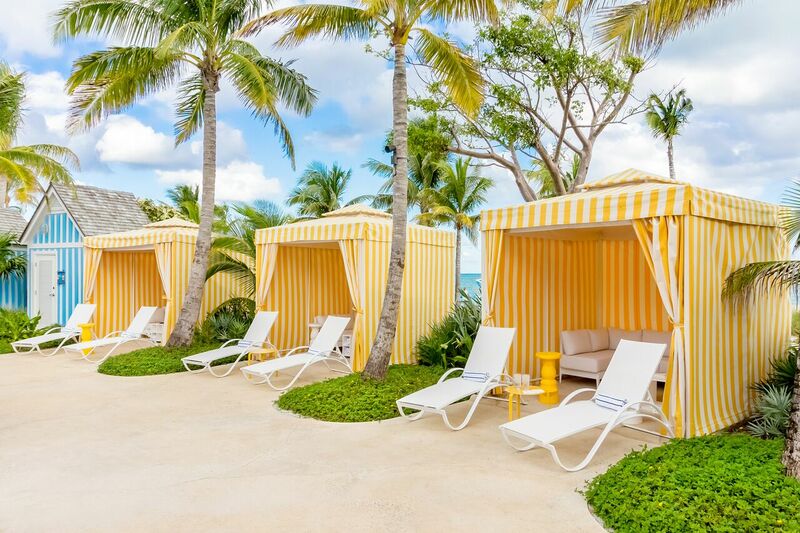 These vintage cabanas feature a minimalist yellow and white design, offering mini-fridges, walk-in closets and phones. W South Beach: The WET deck at W South Beach – among the largest pools in Miami Beach – is lined with private open-air cabanas for the ultimate play, sip and savor experience. Each cabana boasts a tropical modern space with comfortable white-cushioned sofas and daybeds, flat screen TV’s, full butler service, and tasty selections from WET Bar & Grill. Zemi Beach House: Zemi Beach House, the luxury boutique hotel on Anguilla’s East End, offers luxurious cabanas with views of one of the world’s best beaches, Shoal Bay East. Guests can take a dip in the infinity pool, featuring an underwater window facing the beach, or relax and enjoy poolside service, all while being steps away from the Caribbean Sea.